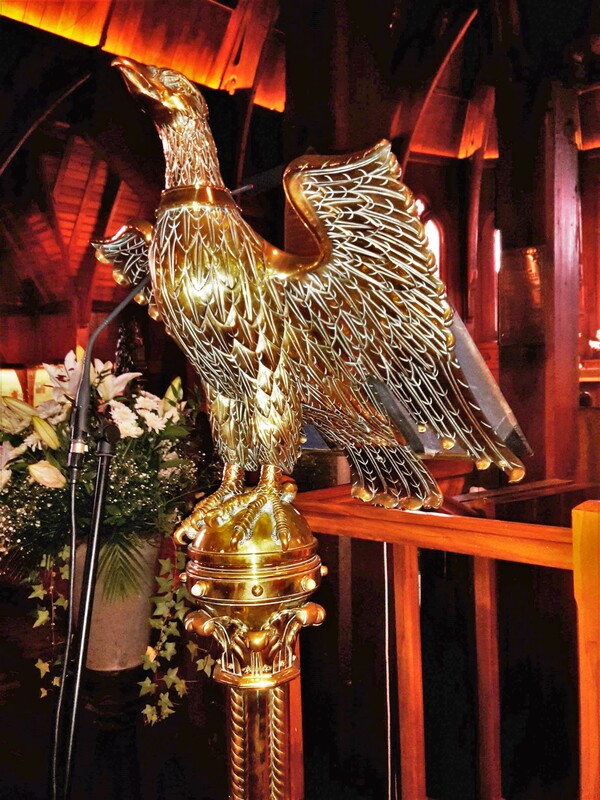 The stately brass lectern at Old St Paul’s is a fitting memorial for one of the richest men in New Zealand history, William Barnard Rhodes. 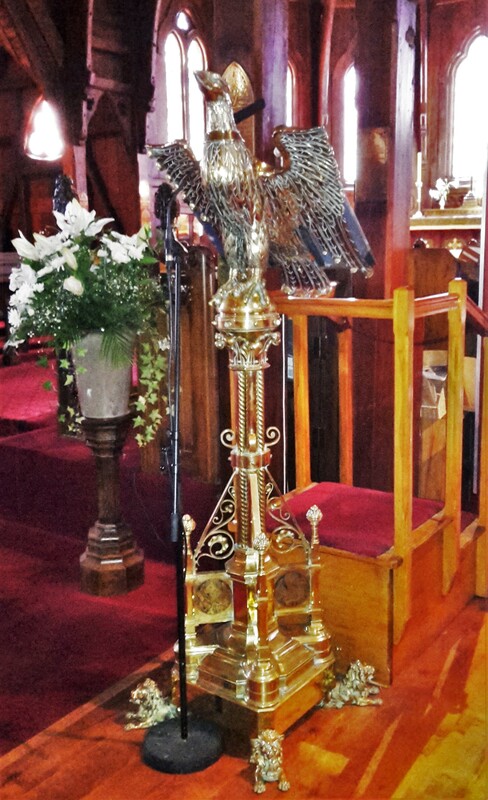 His wife, Sarah Anne Rhodes presented the lectern to the church in 1881. It was manufactured by Messrs Cox of London. William Barnard Rhodes was born in a small town of Lincolnshire, England in 1807. In his teens he set to sea, travelling to South America, Africa and Indian, before settling in Australia. A whaling expedition in 1836 saw him leave for the shores of New Zealand, of which he wrote about in a journal, which you can read in full here. After acquiring land here, he finally settled at Port Nicholson (Wellington) in 1840. Much of his earliest wealth was made through the farming of sheep and cattle in partnership with his brothers. Once he was based in the city, he turned his attention to commercial enterprise and established the firm W.B. Rhodes and Company. By 1853 he was being referred to as ‘the millionaire of Wellington’. 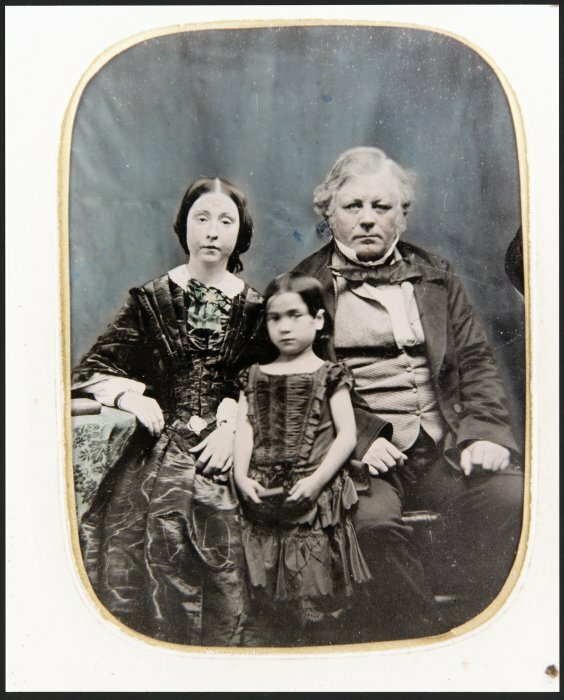 William Barnard Rhodes with his first wife Sarah King and daughter Mary Ann, 1858. Rhodes also became very involved in local politics and financial organisations. He was a member of the Wellington Provincial Council, the House of Representatives and a founding member of the Wellington Chamber of Commerce. 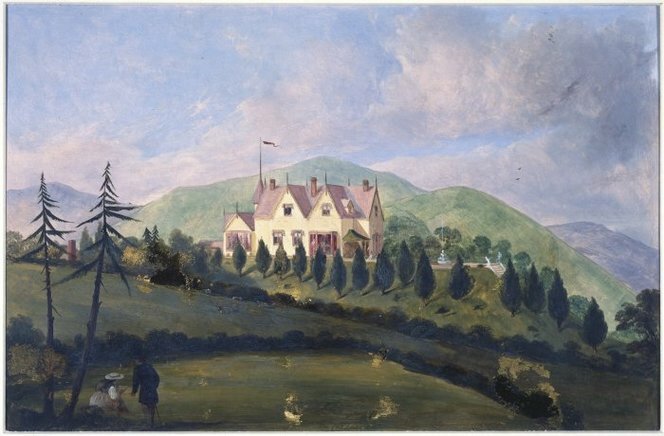 In the 1860s Rhodes built a grand house on Wadestown hill, known as ‘The Grange’. In The Streets of My City, Fanny Irvine-Smith describes it as ‘one of the most picturesquely placed homes in this or any city’. Here Rhodes lived with his first wife Sarah King and daughter Mary Ann. After the death of Sarah, he later married Sarah Anne Moorhouse who resided in the Grange for many years after Mr Rhodes’ death in 1878. View of William Barnard Rhodes’ house The Grange. Painting by Henry Tilbury, 1869. 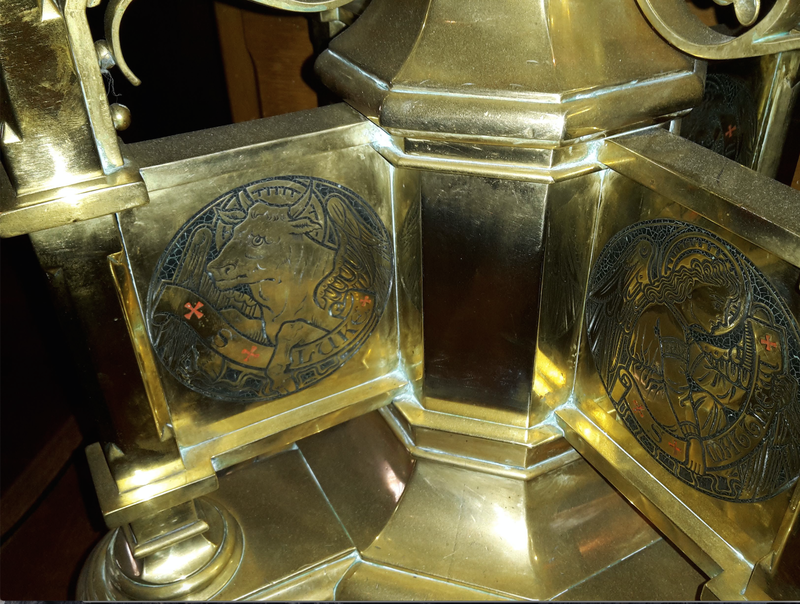 The second Mrs Rhodes gave generously her time and money to both the city and the church. For this she was made a Lady of the Order of St John of Jerusalem – the first New Zealand woman to be appointed into an Order of Knighthood. The brass lectern was not the only memorial presented by Mrs Rhodes. She gave the city its mayoral chain, and the hour bell of the Post Office Tower clock; at the time it was thought to be the largest bell cast in the Southern Hemisphere. She also left £10,000 to Victoria University College for the higher education of women, a fund which is still awarded to women studying at Victoria today. For more information about Rhodes, see Brad Patterson. ‘Rhodes, William Barnard’, from the Dictionary of New Zealand Biography. Te Ara – the Encyclopedia of New Zealand, URL: http://www.TeAra.govt.nz/en/biographies/1r7/rhodes-william-barnard. Other sources: The Cyclopedia of New Zealand [Wellington Provincial District],” Wellington, 1897. Fanny Irvine-Smith, “The Streets of My City, Wellington New Zealand,” Wellington, 1948; Ashburton Guardian, 16 June 1910, p.3; Evening Post, 9 May 1881, p.2, Evening Post, 3 January 1914, p.7. Images: Tilbury, Henry: Grange, Highland Park, Wellington, New Zealand. The residence of W. B. Rhodes Esq. J. P. 1869. Ref: NON-ATL-P-0084. Alexander Turnbull Library, Wellington. http://natlib.govt.nz/records/22432937. Ryle-Hodges, Eddie, 1939-2001. Photograph of W B Rhodes, Sarah King, and Maryann Rhodes. Ref: PAColl-5601. Alexander Turnbull Library, Wellington. http://natlib.govt.nz/records/22523773.